1. How can I Register for the Buzz Rewards Program? 2. Who is eligible for the Buzz Rewards Program? 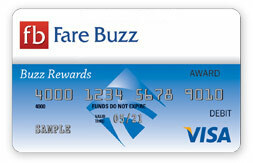 All existing members of Fare Buzz are eligible for Buzz Rewards. All travel Professionals who are looking to Sign Up with Fare Buzz are eligible. ** New Points system is Applicable for Bookings made March 21, 2011 onwards. 4. How many dollars do I get for each point? One point equals one dollar in purchasing power. 5. How many points do I need to get a reward card? You need a minimum of 5 BuzzRewards points to receive a reward card. 6. Where can I use the reward card? Buzz Rewards Card can be used for shopping, travel, entertainment, dining and much more at over 200 of the nations top retail and travel providers. 7. How can I check the points for the bookings I make? You can look up your Rewards Summary online anytime. 8. When do I receive the reward card? You will receive the Buzz Rewards Card two weeks after you reach 5 Buzz Rewards points. 9. How often are points credited to my account? Your account is credited once a week. 10. How do I make changes to my membership details? You can log on to www.farebuzz.com/rewards and click on "My Account". 11. How can I check my Rewards Summary? You can log on to www.farebuzz.com/rewards and click on "Rewards Summary". 12. How can I check my card balance? You can log on to www.farebuzz.com/rewards and click on "Point Balance". You can go to www.MyPrepaidCenter.com and enter the card number to look up your card balance. 13. Does the reward card expire? Yes. Your card will expire when the valid thru date on the front of the card passes. Funds do not expire and may be available after card expiration date, monthly account management and post-expiration re-issuance fees may apply, subject to applicable law. 14. Do my points expire? Due to the type of card this is the card will expire but the funds will not. Funds do not expire and may be available after card expiration date, monthly account management and post-expiration re-issuance fees may apply, subject to applicable law. 15. What do I do if the card is lost or stolen? Record the card number and the Customer Service number listed on the card back and on the materials that accompanied the card. Should the card become lost or stolen, contact Customer Service immediately and provide the card number. This report must be made prior to 15 days before the valid thru date printed on the Card.